What do you get when Sonic, or someone who is clearly supposed to be a representation of him appears in something that's NOT a Sonic show or game? 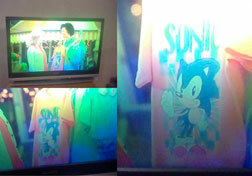 You get a 'Sonic Cameo'! These aren't items, they're representations of Sonic or Sonic characters appearing outside of anything where you'd expect to find him. Items or areas from the games count too, sometimes stuff like this is an 'easter egg' in other games. Since Sonic is so popular it's no wonder that a variety of different media reference him. By looking at these photos, screen shots, videos and more, you can track down the original things and watch them/see them for yourself. 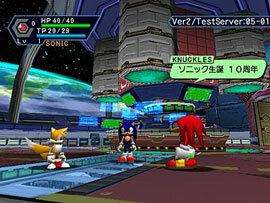 Phantasy Star Online was the ORPG developed by part of Sonic Team for the Dreamcast. 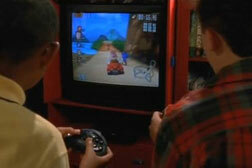 This is a photo from the lobby area of the old Dreamcast ship. It's a test server (seen in top right where the name of the ship would usually be) and this is a photo of the developers trying out the 3D character models they made for Sonic, Tails & Knuckles that work in the game. They acted as "mini mascot suits" where a developer could control them just like a real mascot suit & interact with characters. 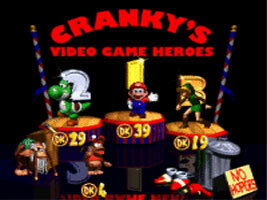 They also appeared as NPCs in a special quest in the game. If you passed the quest (Help Sonic get rings by solving fence related puzzles) you could get a prize weapon. It was the "Sonic Knuckle" which was a pair of Knuckles-like gloves your character could wear! Sonic would even follow your character around in the area, as you switched fences on & off to try to solve the puzzles on Ragol (the planet you see out the window in the photo). They talked to you (with a script) so it was really a cool crossover & something special for the fans. Each edition of Phantasy Star (Universe & Online2) also got Sonic things for you to see. Quick! Say the names of the characters you see in this picture! 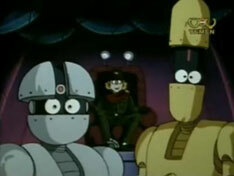 Did you say Bocoe & Decoe from Sonic X? If you did, you would be... somewhat wrong because this is a surprise reverse...cameo? The robots you are looking at here are actually Omega & Epsilon from TMS Hasshin. What's that? Some other show that actually came before Sonic X...so Omega and Epsilon here are not knockoffs, nor are they cameos. It's actually sort of the reverse, Sonic X seems to have 'recycled' these two robots, as you can see how similar they are in their design. It isn't even a cameo really. 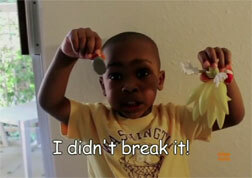 But here it is. "Sonic the Hedgehog and The Beatles: A Comparative Analysis of the Games and the Music offers fresh takes on both the video-game series and the legendary band. 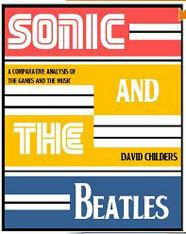 With comparisons between the games and albums themselves, as well as examination of the relationship between the Sonic series’ classic titles and maligned modern entries and how it mirrors the perceptions of The Beatles as a band and as less-celebrated solo artists, this book takes a detailed look at a previously unexplored and unconsidered area of either entity’s lore. Want to know why Sonic 3D Blast is the video-game equivalent of Let It Be? Do you wonder what Sonic Heroes has in common with John Lennon’s Some Time in New York City? Sonic the Hedgehog and The Beatles will answer these questions and many, many more." This is a UK book and it can be bought for the Kindle at Amazon. Book discovered by Berzerker. What does the music analyzing book author have to say about the actual Sonic content of the book? "The idea of the book is that the overarching theme being that each entity (Sonic and The Beatles) share similar legacies. That isn't to say that I'm comparing and contrasting the quality of the Sonic games vs. Beatles albums, but rather how earlier works compare with later ones. Just as The Beatles' solo works haven't lived up to the legacy of their output as a band, Sonic games always seemed to be judged against their 16-bit brethren. Obviously, I think nostalgia has a lot to do with it. Not that we've collectively overrated The Beatles and Genesis/MD Sonics, but that subsequent output for each is seemingly dismissed out of hand. In some instances, it's fair, but in others it creates scenarios in which certain games/albums are vastly underrated because they're being pitted against masterful material coupled with a sort of aggressive nostalgia. The book is small, it's rather short, clocking in around 105 pages if printed on 5X9" sheets; also, it could become a Kindle Single. It is trying to illustrate which games/albums deserved the dismissive reception and which were underrated, I noticed numeorus, more interesting parallels. The 16-bit-era games each essentially align with a noteworthy Beatles entry, and they do so in chronological fashion. Sonic 1 is a fresh take on an old formula - a la Please Please Me. Sonic 2 is more colorful and varied, and is considered by many to be the quintessential Sonic game - Sgt. Pepper. Sonic 3 & Knuckles: A more chic 'best Sonic game ever' pick, but still a relatively mainstream choice. The lock-on technology allows two games to "flow" into one another - Abbey Road, probably the second-most cited 'best Beatles album,' features a medley to close the album where the songs flow into one another. Sonic 3D Blast: A pretty good game that doesn't live up to its predecessors but accords itself well in its own right - Let It Be. It gets weirder, as the parallels grow stronger after delving into the solo works, with John Lennon's first two albums Plastic Ono Band and Imagine, representing the Sonic Adventures, both in how they were considered stellar upon release, still hold up well and are remembered relatively fondly when specifically brought up, but have become less memorable than their initial 16-bit Sonic/Beatles output and seemingly get lumped in with "crappy" 3D Sonics/Beatles solo material. Sonic Heroes, OK, but shakier than either adventure and features the team dynamic - Lennon's third album Some Time in New York City was more uneven and less acclaimed than the previous two albums and features its own team dynamic, as he splits tracks with Yoko Ono for the first time. These uncannily continue (and all Beatles, save Ringo, are represented in their solo work) and there's a Beatles-related counterpoint for every major Sonic release through Sonic 4 episode 1 and Sonic Generations." This is a sort of accidental cameo. 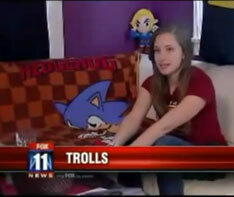 Fox 11 News was doing a story about internet trolls & clearly interviewing someone in their own home. (Maybe a troll...or a victim?) However, they had their classic Sonic fleece blanket on the sofa in the picture as well as some kind of 'chibi Link' plush there in the background. You can see bigger photos & read more at Seibertron.com , who did these photos. 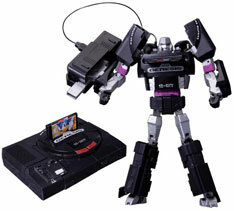 This is "MegaDrive Megatron" he's a real Transformers toy with a cool cartridge addition! Even though he is a bad guy, he turns into the Sega Megadrive AND has a repro original Japanese-look (The Japan cartridge was different than the USA / EU ones) Sonic 1 cartridge. 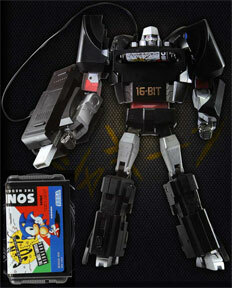 At left, it looks like a normal Megadrive...but then (transforming image is of a non-painted one) it turns into a decepticon! This isn't a cameo for Sonic himself, but rather for Green Hill Zone. 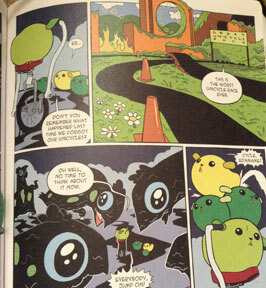 This is a comic of "Mameshiba" which is a Japanese soy-bean based character. This bean is given a dog face & small dog ears. It was created for a TV commercial, where the bean would appear to people and tell them a random fact such as "a hippo has pink sweat". *It took longer to explain the premise than it did the cameo itself...because it is just that strange.